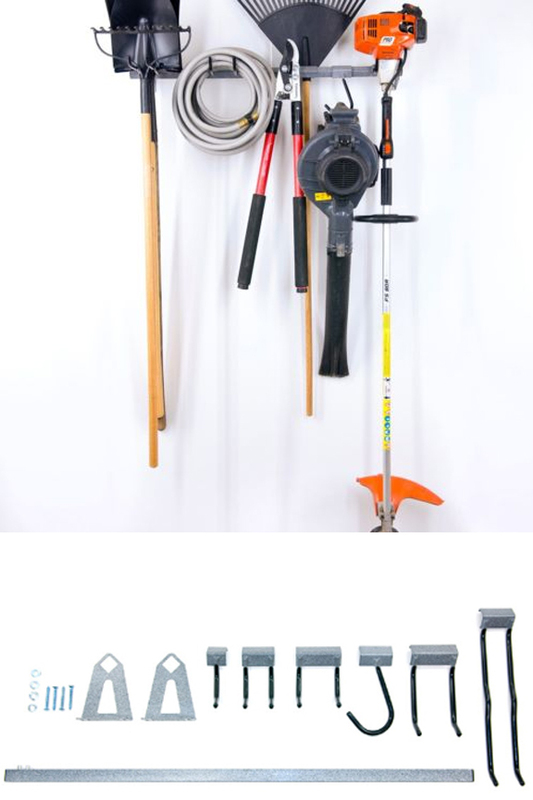 Super Tough Yard Tool Organization by Monkey Bar Storage. This tool storage rack doesn't mess around. Monkey Bar Storage systems are some of the toughest, and longest lasting solutions for organizing the clutter in your garage, basement, utility closet or shed, and this garden tool rack is no different. It's made from heavy gauge steel, and will hold nearly 200 lbs of assorted tools. Due to the clever design, and the various shapes and sizes of hangers that are included, you will be able to stow everything from shovels and rakes to weed whackers and wheelbarrows. Thanks to the space saving design and ability to move each hook, you will also be able to hang things in many different configurations in order to maximize your storage, and take up as little space as possible. This storage rack is wide enough to hold a number of tools without seeming cluttered, and it sits far enough away from the wall to accommodate large or odd shaped things easily. You can even place the hooks facing in either direction to have the tools you use most up front and easy to reach, while the ones less frequented remain neatly stored in the back and out of the way. This is a complete kit that will allow you to store more than 6 tools and other assorted things like hoses and cords. It's incredibly easy to install, and it comes with a limited lifetime warranty, and all of the mounting hardware you need. This is the small version of this storage rack. We also carry the larger one, so if you think you will need a more capacity, check out the 51" Large Tool Rack. one 35" Monkey Bar with the mounting brackets and hardware. The package is completed with the inclusion of easy to follow instructions that detail the quick and simple install. 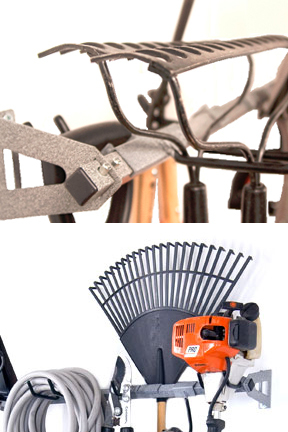 All of the parts are heavy-duty and commercial grade, so once you hang this rack, you can be sure that you will have a strong and efficient way to store your tools for many years to come. The hooks are all coated with plastic for added grip, and to protect your tools while they hang. The "J" Hook is great for hanging things like leaf blowers from the handle, but can also be ideal to quickly hang an extension cord, pair of gloves, or some garden shears. 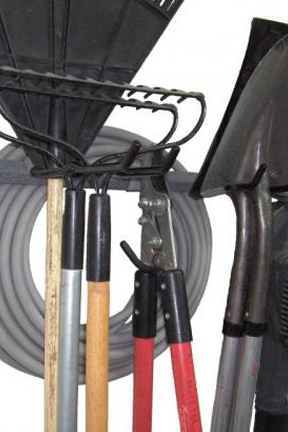 The long, 12" double hook is perfect for holding multiple shovels or rakes, stacked one in front of the other. You can easily store four or more tools on this one hook alone. Use the 3" single hook to hold up hedge clippers and other pruning equipment, or any other tools that can easily balance at a mid point. 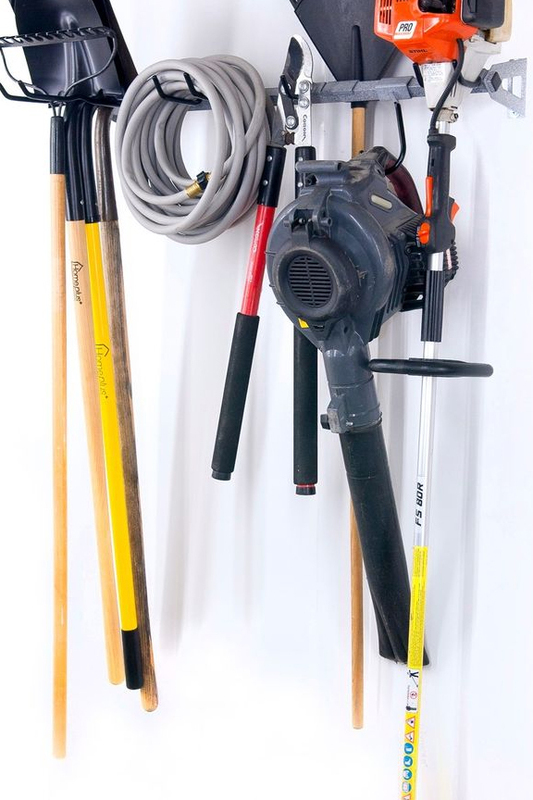 The fatter rear end of a weed whacker is easily supported by one of the wide double hooks, and these types of hooks are also perfect for hanging cords and hoses neatly to keep them from unrolling or getting tangled. This wide variety of hanging hardware will make it easy for you to store just about any tool you have, and the sturdy construction will ensure that they are held securely in place when not in use. The Monkey Bar Small Garden Tool Storage Rack is pretty simple to install. Many garages and sheds have exposed studs, so finding a secure spot is easy. If your space has been sheet rocked, you will need a stud finder to locate an adequate spot. You can also install on brick, cement or cinder block walls as well. The size of the bar is such that it perfectly spans between two studs to ensure that you are screwing into wood when you install. The mounting brackets can be used in either direction so you can flip them one way or the other in order to line them up perfectly, or fit the bracket into a tight space. The whole installation should only take 10-15 minutes from start to finish, and it only requires you to drive in four screws. For a perfect install you will want to use a level to ensure the bar is straight, and you will want to drill pilot holes before you set your screws. Once the brackets are on the wall, simply insert one end of the monkey bar into the hole on a bracket, and then press down the button to stick the other end in the opposite bracket. Once you depress the button, the bar will be secure and immovable, so all you need to do is hang up the hooks in order to finish the install. Each hook can face front or back, and they can be in any spot along the whole length of the bar. Once you have the hooks in place, you are ready to take the clutter off the floor, and quickly hang it in an organized fashion. That pile of tools in your garage can take up a lot of valuable floor space. You can try to neatly lean them into a corner, or shove them all into a bucket, but that won't make it any easier to see what you have, or allow you to quickly retrieve the tool you are looking for. Methods like these can reduce the life of expensive tools, and lead to accidental breakage. Plus, your garage or shed will always look like a cluttered mess in the mean time. The best way to maximize your space, and keep everything organized is to get a tool storage rack and hang everything up off the ground in a neat and orderly manner. You could spend less money on a cheaper solution, but it will never have the durability and versatility that this one offers. Due to the design on this one, it's not just stronger than the competition, it's also able to hold 2-3 times more stuff than other, similar sized storage units. Because you will be using this to store heavy tools and other bulky, outdoor equipment, you really want something that is up to the task. This heavy duty storage rack will last longer than the tools it is meant to hold up, and you will never have to replace it like you might with less sturdy options. Get the Small Garden Tool Rack from Monkey Bar Storage and you will have a strong and simple solution to help you clean your garage, and organize your tools. Dimensions 35" x 18" x 4"
Capacity Holds up to 200 lbs. Parts Included 2 brackets, 4 screws and washers, one 35" Monkey Bar, one 3" double hook, one 3" single hook, one 3" wide double hook, one 5" wide double hook, one "J" hook, one 12" double hook and installation instructions. Moveable Hooks Yes - slide along the length of the bar to any position. Place forward or backward. Compatibility Works with virtually any tool. Installs into wood studs, concrete, brick or cinder block. A heavy duty storage and organization system from Monkey Bar Storage. Get the clutter off the ground and hang it neatly with this versatile rack. It can be used for virtually any type of yard tool you have, and it installs in under 15 minutes. Order Yours Today! Great product ---the holder has strength . This is a Monkey Bars Garage Storage system. I have a similar hanger, but when I lift a tool off the hanger it unsnaps at the bottom and I end up with both the tool and hanger. Do the hangers on this monkey bar rack unsnap when a tool is lifted off of them? No, they do not. The hooks stay securely in place to make operation flawless. A Parking Aid For Your Garage. Get Perfect Positioning Every Time. A Smaller, More Portable Siphon Starter and Pump Tool. An Advanced Replacement Head For Your Gas Trimmer. 18 x 48 - A Fixed Work Space Or Storage Shelf With Integrated Hooks For Extra Stuff. Holds Up To 400 Lbs. Add colorful ambiance anywhere. Use indoors, outdoors, even under water! High quality design for long lasting performance. The perfect all-purpose landscaping tool.